For additional instructions on Standing Memorials and Hanging Memorials see notes below. CAUTION: Contains Portland cement and silica sand (ours also contains iron oxide pigment). Contact may cause eye damage. Harmful if swallowed. May be irritating on prolonged skin contact; wash hands immediately after use and avoid breathing dust. Call your local poison control center for more health information. PARENTAL SUPERVISION IS REQUIRED. Cut open the bag of powdered mix and gently empty into a plastic bucket. Stir the powder for a minute or so to ensure that the contents are evenly mixed. Avoid breathing the dust and touching the mix; we recommend using a dust mask and latex gloves. Then scoop out six level tablespoons of the powder and set aside. Stir 1 1/2 cups water into the powdered mix and combine thoroughly. The consistency of the wet mix should resemble a thick pancake batter or pudding. If the mix needs thinning, add one tablespoon of water at a time until it reaches the desired consistency. Make sure all the powder is uniformly moistened. Before pouring, evenly coat the inside of the mold with vegetable oil using an inexpensive paint or craft brush. Any small pools of excess oil should be dabbed up with the paintbrush; extra oil can sometimes discolor the finished stone. At this time note the “up” end of the design by marking the lip of the mold with a pen or piece of masking tape. It’s very easy to place the wire hanger at the wrong end after the mixture has been poured and the design is no longer visible. Pour approximately one-quarter of the mixture into the mold, just enough to cover the design surface. Hold two sides of the mold by its rim then gently tap the mold on the tabletop. (Eye protection is strongly recommended; overly vigorous tapping can sometimes cause “splashing”.) This vibration will eliminate air bubbles trapped in between the wet mix and the mold’s inner surface. You’ll see these air bubbles rising to the surface of the mix. Continue tapping for approximately one minute. To be certain that all air bubbles have disappeared, lift the mold slightly above eye level and check the bottom for any remaining bubbles (take care not to tip the contents of the mold!). If any bubbles remain, tap a bit longer. Now fill mold with remaining mix. Tap the mold again to level the mixture and to eliminate air bubbles clinging to the sides of the mold. Clean the mixing bucket using the garden hose; never wash any remaining mix down the sink. Tap gently to remove air bubbles. Let the mold sit for 48 hours at room temperature. Even though the mix will be firm within 24 hours, it’s still fragile and can easily crumble if de-molded prematurely. Another, more interesting, option is sanded grout. Sanded grout can be found at any large home improvement center or tile and marble supply businesses. It comes in a wide variety of lovely earth tones, unlike plain gray concrete patch mix. To make one plaque, scoop out 5 cups dry sanded grout, and then add 1 1/2 cup water. Stir in additional water if needed to make a pudding-like consistency. (Please note: grout also comes un-sanded; be sure not to buy this!) The grout may take up to 3-4 days to harden before removing the plaque from the mold. Allow the stone to cure another week before hanging. 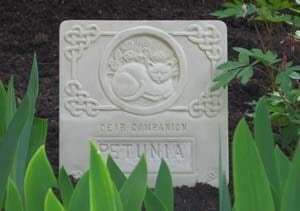 To create a Pet Memorial Wall Plaque follow the Wall Plaque instructions at this point. Cut two 18” lengths of half-inch copper pipe, then press pipes into the wet mixture. Allow some of the mixture to partially fill each pipe; this will help the pipes set more securely in place. The tips of the pipes should protrude slightly from the mix. If the pipes begin lifting up out of the mix, place wood blocks or toweling underneath the pipes’ opposite ends to stabilize. Then snip the kit wire in half using wire cutters. Bend into two U’s. Place the wires over both pipes, making sure that the ends are well submerged in the concrete mix. De-mold the memorial plaque after 48 hours. Then fill the blank cavity on the plaque with water and allow to soak for 20-30 minutes. This helps moisten and condition the stone before the second pour of concrete is added. After one hour, empty the water from the cavity. Then mix 2 1/2 tablespoons water with the 6 tablespoons set-aside powder. Pour into the empty plaque cavity, jiggling lightly to level the wet mix. Allow to harden for approximately one to two hours. While waiting for the mixture to set, cut out the letters and numbers needed for your pet’s name. Each letter and number on the plastic sheet is surrounded by score marks. Try to cut these lines as accurately as possible because they’re a useful reference point when aligning the letters and numbers in wet concrete. Within one to two hours, the mix in the cavity should be adequately set-firm, but slightly yielding to moderate finger pressure, much like clay. When a letter is pressed into the concrete, the indentation should appear crisp and uniform and no wet mix should cling to the plastic. Otherwise, allow the mix to set a while longer. After lettering, allow the plaque to cure another week before hanging or placing in the ground. The plaques can be painted with acrylic paint. Or for a softer, subtler look, try an acrylic wash. Allow the stone to cure for a week, then dilute 1 teaspoon of any warm, earthy acrylic color (brown, moss green) with approximately 2-3 teaspoons water. Brush the wash over the entire surface of the plaque, then wipe off the high points of the design with damp paper toweling. The wash remaining in the lower nooks and crannies will dry, and this color contrast will accentuate the design details. If you don’t care for the appearance of the wash, remove using a soft bristle brush and warm soapy water. These molds can be reused many times with proper (gentle) care. For refill material, one option is concrete patch, sold in 6-pound boxes at just about any hardware store. For one plaque, scoop out 5 cups concrete patch and add 1 1/2 cup water. Stir in additional water if needed to make a pudding-like consistency.